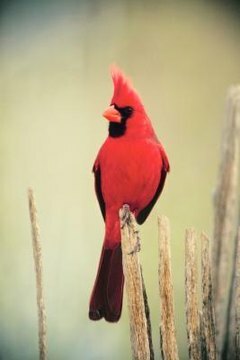 Several types of birds enjoy eating from ground feeders, including cardinals, doves, sparrows, goldfinches and doves. Making your own ground feeder is an inexpensive project that takes little time and few materials to complete. This type of bird feeder includes materials to promote bird health in an easy-to-fill style that is long lasting for your bird-watching pleasure. Stretch a measuring tape down the length of an 8-foot-long, 1-by-2-inch board. Lock the measuring tape and place it on top of the board. Mark the board with a carpenter's pencil for two 1-foot pieces, two 2-foot pieces and four 3-inch pieces. Remove the measuring tape and put on safety glasses. Cut the wood on the marks with a circular saw. Place the two 2-foot pieces on a flat surface to form the top and bottom sides of the feeder. Insert the two 1-foot pieces on the left and right sides inside of the top and bottom. Turn the pieces so the 1-inch sides touch the surface and the 2-inch sides are the height of the feeder frame. The form will be a rectangular shape like a picture frame, with the top and bottom touching the two sides. Using a drill, insert one 4-inch galvanized screw into the four corners of the feeder through the top and bottom and into the sides. Place the four 3-inch pieces on each of the four corners and attach them with a galvanized screw. This makes a leg on each corner that is 3 inches tall. Turn the ground feeder over and stand it on its feet. Measure the inside with a measuring tape and cut a piece of screen or fine mesh that's one inch larger on all four sides with wire cutters. Insert the screen inside the top of the ground feeder. Press the 1-inch excess up the sides of the feeder. Staple the excess to the feeder frame with a staple gun about every linear 4 inches. Pour birdseed into the ground feeder on top of the screen or mesh.  The wooden sides provide a perching area for feeding birds. The screen or wire mesh bottom allows bird droppings and rain to fall through the bottom and keep from contaminating the birdseed.  Add a small, shallow bowl of water near a ground feeder to help attract birds.  Clean your ground feeder once to twice a month by immersing it in a solution of nine parts water and one part bleach, and then rinse it thoroughly with water. Rake and dispose of any seed on the ground to prevent it from molding and causing disease to birds. ⚠ Place ground feeders in a convenient area to refill them that is within 3 feet of windows or at least 10 yards away from windows to prevent bird collisions with the glass.